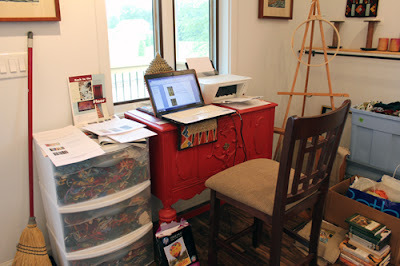 There were quite a bit of odds and ends done this week along with the task of shortening the "to do" list. "Missing Windows" was finally completed. 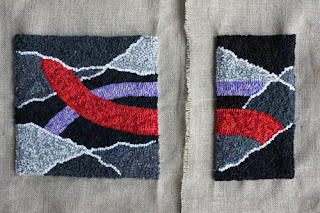 Yarns similar in color to the hooked wool were used for whipping the edges and nails were hand-stitched to the black window portions. 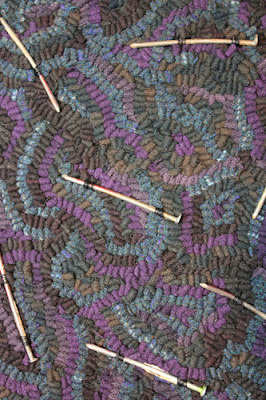 I am sealing the doorplate that will be used to sign the piece and will stitch it on this coming week. Here you can see the various colors used in the dark window sections. I used nails that I collected when builders were working on the studio. I love the different shapes and the paint and plaster attached to some of them. Quite a bit of paperwork was done preparing folders for classes, calls and e-mails were made for permission to use photos of other artists' work and planning was made for a panel discussion to be held at the TIGHR conference in October. I worked on framing for pieces being shipped to Sauder Village for the Plein Air group exhibit. I also tested frame sizes for the two section piece "Bridging the Gap". 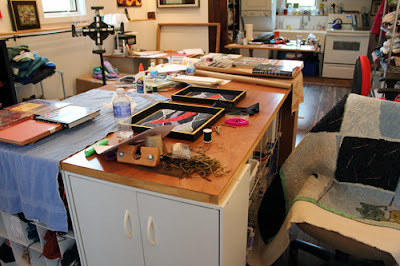 On the table to the left and the far right you can see books sitting on top of backing paper glued to the back of framed works. After the glue sets, a box cutter will be used to trim extra paper, the work will be signed, hanging wire will be installed and the work will then be ready to pack. 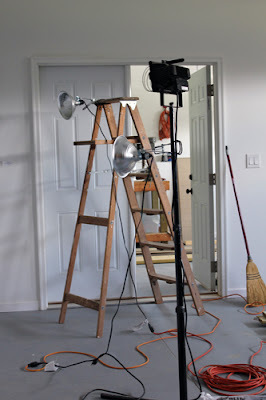 Photos of various works were taken with lighting attached to ladders and poles. Hey, there's that broom from the paperwork photo above. It sure does get around! Though there is still quite a bit of work to do, it felt good to get some items crossed off this week. Check off some of your own "to do" list items, enjoy your accomplishments and have a great day. An invitation to the opening of "Origins in Geometry" Biennial at the Museum of Geometric and Madi Art in Dallas, Texas was received this week. 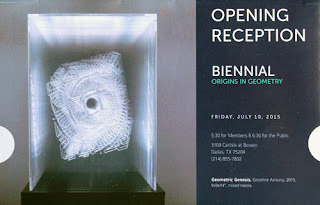 My work "Mountain Reflections" will be in the exhibit from July 10 through October 5. I really wish I could be there! From entry procedures to receiving work, the museum staff have been wonderful. The link to the site above will give you more information. 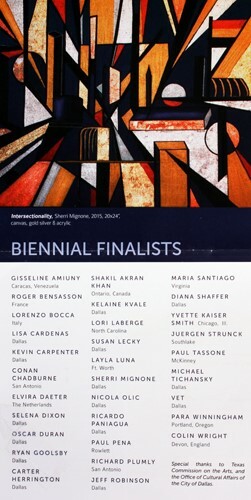 The invitation included the list of show finalists. I am honored to be included among the artists in this group. The hooking part of the work above is completed. I will need to create my own art boards for this work as the sections are not of standard size for pre-made boards. Also, on the to-do list is ordering frames and cutting metal bars to attach the two sections. Earlier this year an invitation was received to join three local artists in a four person show on landscapes. Since I have not shown my landscapes in exhibit form yet, I thought this would be a good opportunity to develop some more complex pieces and experiment with some 3-D works. 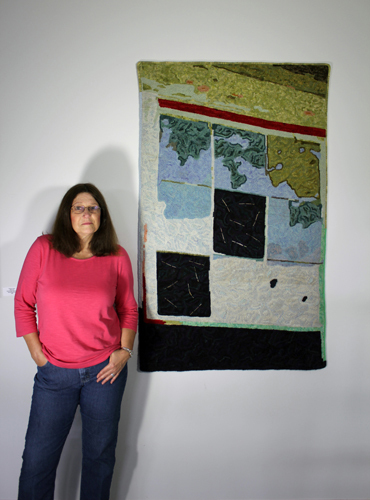 The show will be presented in the June/July time frame of 2016 at the TRAC Gallery. 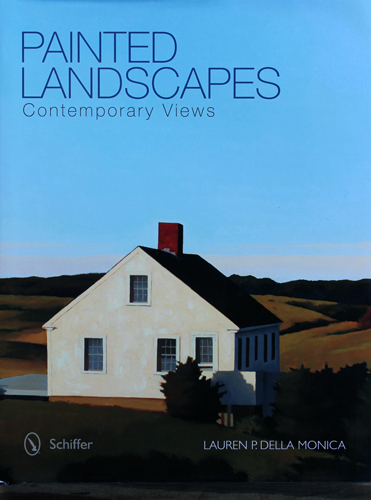 I have been studying up on landscapes and purchased "Painted Landscapes: Contemporary Views" by Lauren P. Della Monica. The book presents contemporary artists works, some historical background and portrays a variety from realism to abstract. Tuesday included a meeting with painter Kat Turczyn, glass artist Simona Rosasco and potter Teresa Pietsch. We discussed ideas for displaying the exhibit, number of pieces from each artist and publicity options. Simona made an unbelievable salad for lunch and we ended with a raspberry sorbet. A great day out. Talking with fellow artists can really create motivation and add to creativity. Make some time to converse with other artists whether in person or through social media and have a great day.